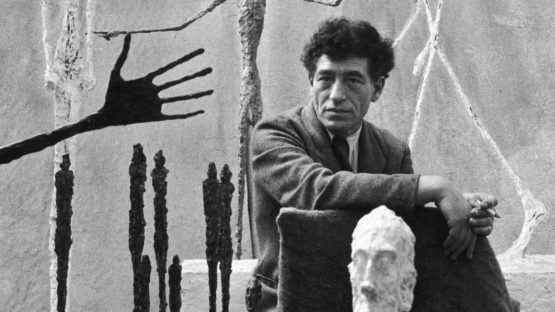 Emerging out of the conceptual basis of Surrealism and Cubism, Alberto Giacometti established his unique aesthetic style with delicate figurative sculptures and expressive portraits that resulted from intense observations. Particularly fascinated by Sartre’s writings for the entirety of his professional career, Giacometti was influenced by the ideas of Existentialism and wanted to make a clean and radical break with sculptural traditions that were stagnating the medium as far as this author was concerned. His artistic output is a unique mesh of ideas coming from the norms of primitive art, psychoanalytic theory and children’s art – his severe figures explore the psyche and the energized space occupied by a single individual. 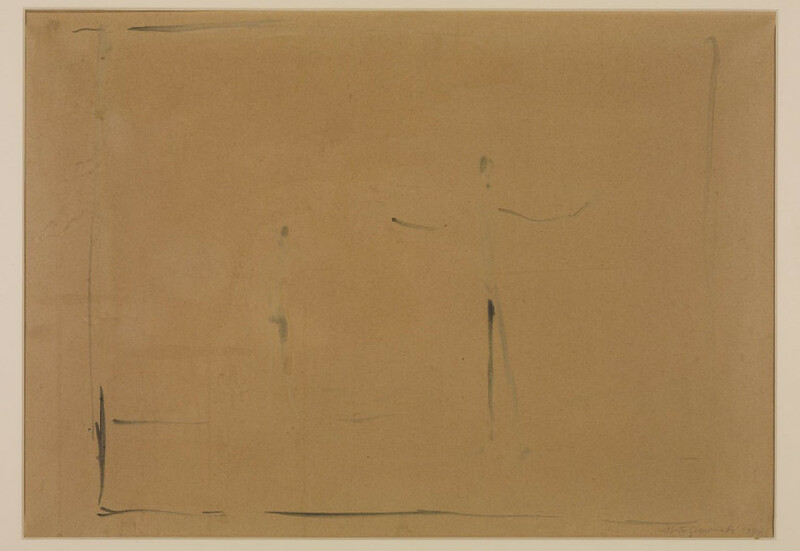 Many experts and art pundits suggest that Alberto’s works can be analyzed and seen as metaphors for the postwar experience of doubt and alienation. It should also be noted that Giacometti’s production extends into painting and drawing as well, but this Swiss-born and Paris-based artist is most famous for his sculpted pieces. Alberto Giacometti was born on the 10th of October in the year of 1901, in the small mountain village of Borgonovo, Switzerland, quite near the Italian-Swiss border. His father Giovanni was an accomplished painter who worked in the Post-Impressionist style. Additionally, both his godfather and an uncle were artists as well – all three of them provided Giacometti with his earliest instructions and artistic directions. When his family moved to the nearby town of Stampa in 1906, Giacometti was already showing a strong interest in drawing. By the time he was in his early teens, Giacometti had begun painting, sculpting and making wood etchings on regular basis and enjoyed great success. Pursuing a career in art making practices, Alberto moved to Geneva in 1919 where he studied at the École des Beaux-Arts and École des Arts et Métiers. In 1920, he accompanied his father to the Venice Biennale and in 1921 he visited Rome, Florence and the surrounding areas. During this time, Giacometti became enthralled with Egyptian and African art. In the year of 1922, Giacometti moved to Paris to study under the sculptor Antoine Bourdelle, an associate of the famous Auguste Rodin. He spent the next four years he studied sculpture at the Académie de la Grande-Chaumière. In the City of Light, Alberto experimented with Cubism and Surrealism, soon coming to be regarded as one of the leading surrealist sculptors. He met and worked with the likes of Joan Miró, Max Ernst, Pablo Picasso, Bror Hjorth and Balthus. Giacometti started nurturing his newfound love for primitive art and his representations of the human body were becoming steadily more abstracted. By the time he graduated, Alberto completely abandoned any realism in his work and instead constantly aimed at conveying the psychological essence of his subject matter. Two of his most important and representative works from this period are the famous Spoon Woman and The Couple. In the early 1930s, Giacometti’s emerging style and its uncompromising nature endeared him to some of the Surrealist movement’s most important figures such as André Breton, Man Ray and Georges Bataille. Their massive influence on his work can be seen in such dreamlike, metaphorical pieces as Suspended Ball (1931), Walking Woman I (1932) and The Palace at 4 a.m. (1932). However, the personal inquiry into the nature of existence would ultimately lead Alberto away from the art of Surrealism. During the latter half of the fourth decade of the 20th century, Giacometti focused his energies on a series of head sculptures that were meant to convey his own physical relation to his models in space. Unfortunately, when he was at the personal peak of creative endeavors, the outbreak of World War II and the advance of the German army into France forced Giacometti to flee Paris and return to Switzerland. During this time, his sculptures became thin and increasingly small in size, lending the figures an air of loneliness and suffering. After Giacometti returned to Paris following the end of the war, he soon found out that his earlier pieces and the existentialist philosophies behind them were already quite popular in the capital of France. His new pieces struck a chord with the pervasive postwar feelings of despair and loneliness. Now highly sought after by both the museums and collectors, Alberto’s work earned him solo exhibitions in New York City in 1948 and 1950. His art became a symbol of just how big a toll the German horrors took on the whole of Europe and Giacometti was oftentimes described as always halfway between nothingness and being. 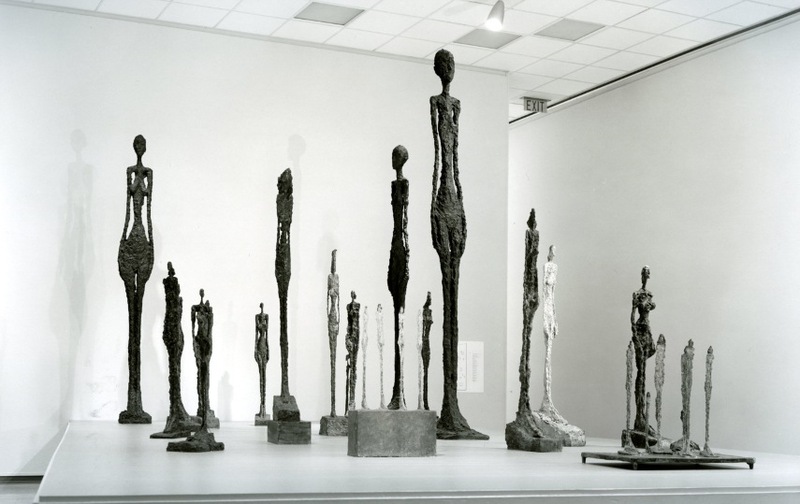 During the 1950s, Giacometti’s work continued to evolve constantly as his sculptures were becoming larger, thinner and more complicated in design. 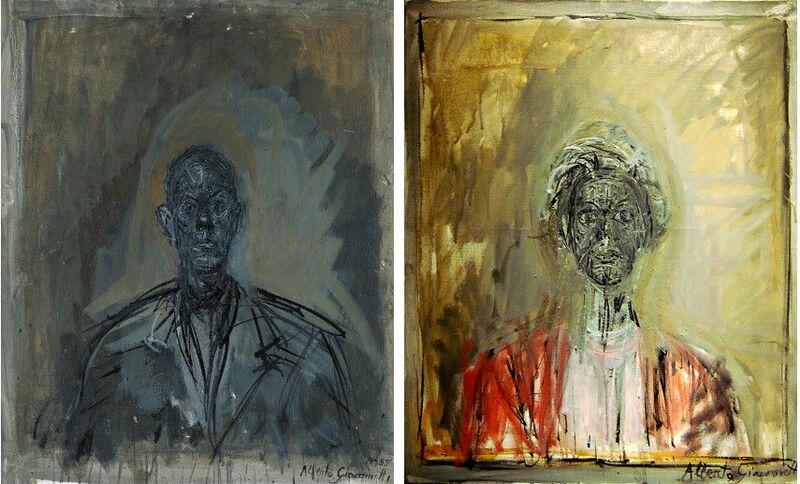 Additionally, he also undertook a series of dark, intense portraits of family members, primarily his wife, Annette whom he married in 1949 and his brother Diego. He also portrayed some of his well-known friends such as Jean Genet, Henri Matisse and Igor Stravinsky. Internationally famous by 1965, Giacometti had many opportunities in the mature period of his life. He began a lengthy period of illustrated works for books by contemporary authors such as Paul Eluard and revered writers of the past like Cervantes and Balzac. He was also commissioned by Samuel Beckett to create a tree sculpture for a production of his Waiting for Godot and in 1962 he was awarded the Grand Prize for Sculpture at the Venice Biennale. This was a true crown of his career as Alberto revered Venice Biennale ever since the time his father took him along on the festival. Two years later, he received the Guggenheim International Award for Painting that was followed by retrospectives of his work at the Tate Gallery in London and the Museum of Modern Art in New York. Unfortunately, by that time, his health was already quite bad. Alberto Giacometti died of cardiac exhaustion on the 11th of January in the year of 1966, in Chur, Switzerland. Ultimately, Alberto Giacometti managed to do what he always desired the most – to inspire and put into motion a radical revision of the representational tradition in sculpture. This evolution within one of the most conventional mediums can be seen as a key moment of shifting enthusiasms within European art after the Second World War and Giacometti led the way for others emerging from that crucial period of 20th-century art. 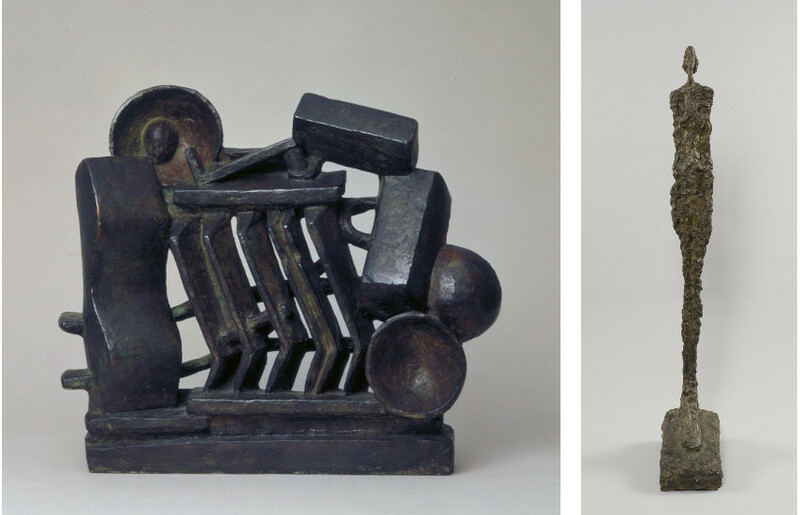 Alberto devised controversial and innovative sculptural forms unlike anything else on the scene, oftentimes reminiscent of toys and games, dictating the future of sculpture as a form of art. His works, whether sculpted or drawn on paper, summed up the artist’s interests in perception, sexuality, obsession, alienation, innovation and anxiety, effectively turning Giacometti into a household name of modern art that won’t be forgotten anytime soon.